Home Blog Can chipped dentures be repaired? Have your dentures broken or in need of a reline? Whether it’s a simple crack or broken teeth, a custom denture repair is required. In the case of a tooth extraction, additional teeth or clasp may be required. This too will need a denture adjustment. Naturally if your dentures are broken, you may initially try to repair them. 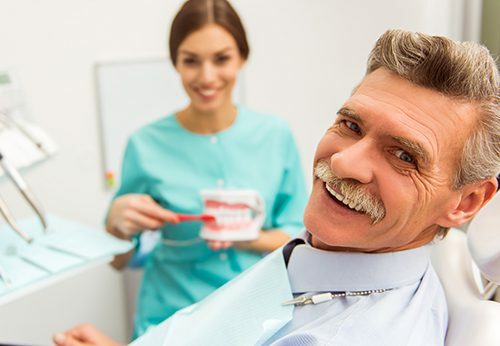 Seek the opinion of a professional like Rod from Dentures At Clayfield who can assess the damage and decide whether your dentures are repairable of if they should rather be replaced. The repair process for dentures is dependent on the individual’s unique requirements and initial assessment. Generally, the repair service will involve taking either a mould or impression of the damaged denture, adding a solidifier or prosthetic teeth. The final stage of the repair process involves curing the denture and polish. Handle dentures with great care. To avoid damage if dropped, stand over a towel or a full sink of water. Clean with a denture cleaner. Mild dishwashing liquid or hand soap can be used for cleaning dentures. Avoid using toothpaste or household cleaners. Brush and rinse dentures daily. Like natural teeth, dentures must be brushed and cleaned daily to remove food and plaque. Take proper care of dentures when not wearing them. To avoid drying out your dentures, it is recommended that whenever you’re not wearing your dentures, that you keep them moist. When not worn, dentures should be kept in a denture cleansing soaking solution or in water. Even with full dentures, it is essential that you’re still taking care of your gums and tongue, with regular cleaning and brushing.